The dark web, a mysterious place where people buy drugs, hitmen, stolen electronics, download creepy games and much much more? Is the dark web a super scary mysterious place people claim to be or is it worse? Is the dark what the deep web? Today you will learn why everything you’ve heard about these terms is likely skewed and why they are actually an extremely important part of the internet. Let’s start with some definitions to get our discussion started. 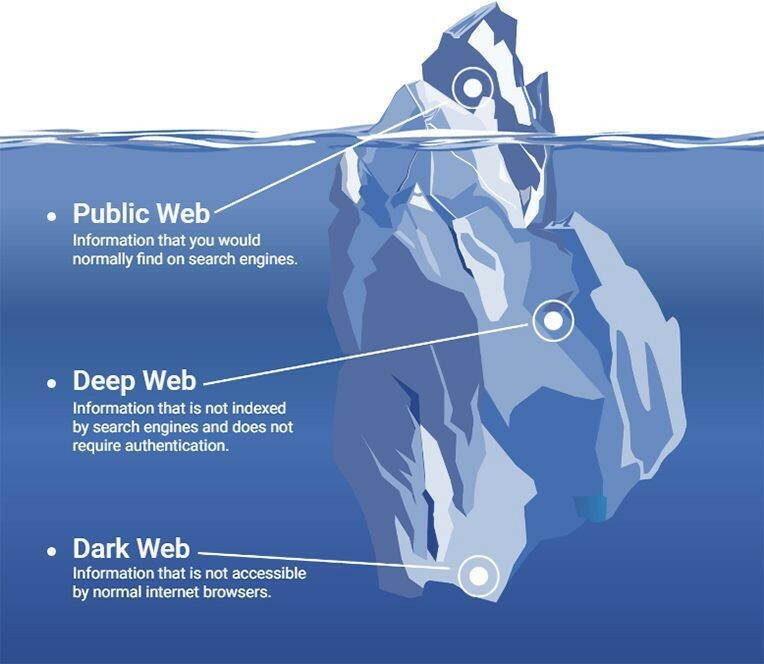 The Deep Web refers to any website or webpage that isn’t indexed by search engines. A simpler way to think about this is a web page you can’t access by searching on Google, DuckDuckGo, Yahoo or any other search engine. One of the most frequent types of sites that fall under this category, which most of you use several times a day is logging into any type of personal account. Any time you log into your social media accounts, Bank, email or anything else that requires a login, which someone can’t access by just having a link to, is the Deep Web. Some other common examples of the Deep Web are any journals or scientific studies that aren’t available to the general public. If you are you’re using the Deep Web as you can probably already tell, there are several misconceptions behind this spooky term, which we will cover more in depth, very soon but before that let’s cover another definition. The Tor network or the Onion Router Network, is a group of servers that improves your privacy and security on the Internet. Normally, without TOR you directly connect to a website, like revkid.com, TOR will obscure this connection by adding nodes. And the nodes periodically change without disruption to you. So unless your entry point and exit points become associated, your connection is considered anonymous. Because of the difficulty required to backtrack in such a short span of time. enforcement the power to go undercover, give the ability to leave truly anonymous tip lines, give support for activists, and whistleblowers and obviously it can be used like many of you in our community to improve your privacy and security. Since TOR is such a powerful tool, it is used for criminal activities, but it’s important to understand that there is an enormous amount of good that TOR does, and we can’t let the bad side ruin it’s reputation. You can utilize TOR today by using free products like the TOR browser bundle, or for a better alternative you can use an operating system built around TOR, like Tails OS or Whonix. I’ll cover all of these in a future article, so make sure to follow us on Twitter to keep up with future content. The Dark Web is any website that requires a user to be utilizing a TOR network to access the site, Typically sites that have this requirement have the TLD, or top-level domain of .onion, instead of .com .org or other common TLDs. For example normally you would access facebook.com, this has no requirement to access, outside of having a working internet connection and no suspicious activity coming from your system. But Facebook does have an onion site found at facebookcorewwwi.onion which will add the requirement of you utilizing the Tor network, to circumvent censorship in countries who block facebook.com. There are other websites like ProPublica, DuckDuckGo, Sci-Hub database and key base, that all has onion sites, meaning when you access these web sites you’re technically on the dark web. People use these two terms, Deep Web & Dark Web, interchangeably when they mean two entirely different things. The Deep Web is utilized by almost every person on the Internet, it ensures that your data belongs to you. It’s a fundamental function of how the web works. The Dark web is not necessarily this evil place people commonly think of. There is a genuine use case for sites that required Tor. The Dark web is a name popularized by governments and the media to make people associate it with this dark mysterious place that’s created for criminals. This is why I called for a rename of the dark web, because all the name does is pollute the public perception of Tor. Here’s a simple new name that I’ve created, the private web. I encourage you to start using this as the new name for any web site that utilizes the .onion domain, since that is what it was created for, Privacy. If you want to get more details on how to start using Tor and how to use it properly, that’s equally important to regain your privacy and security on the internet, make sure to keep visiting because I will be posting a complete course that will help you keep you private. Everything you need to know about privacy, security and anonymity online, Tor is an excellent way for us to accomplish this. That is all I have to say, remember to join our community on our social platforms and make sure to share this post with others and to follow to stay up with any future updates.